Scary Terry's World: SCARY MONSTERS A-GO-GO! Another Scary Monsters wraparound cover illustration done! This is pencil, ink and Photoshop -- not a bit of paint, this time. All images are from the ultra low budget flick,Monster A Go-Go! 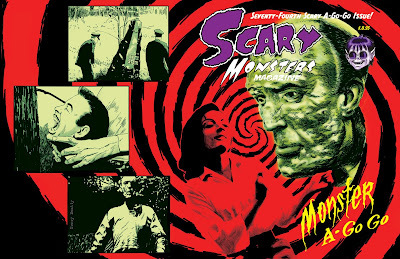 My "Wolfmen" cover for Scary Monsters #72 has been nominated for a Rondo Hatton Award -- you can see the ballot HERE. killed it! what inspired the stylistic step ups in this one? I felt the subject matter needed a "psycho 60's" poster-like approach. The editor requested a hypno-spiral (the movie's poster sort of has one) -- and the photo ref just led me in this direction.